Why have regular pancakes when you can have triple chocolate crepes? Pancakes. Oh, do I love me some pancakes. My mom was the absolute crepe queen. She made the best non-greasy, almost paper-thin crepes with a tiny crunchy edge. She spread Nutella over them while they were still warm and then she rolled them into crepe cigars. They’ve been my absolute favorite ever since I was a little girl. And let me tell you, when you spread Nutella over a warm crepe and then eat it cold, once the Nutella has completely melted, you really get the best crepe possible. And whenever she made them, she made plenty. She never saw the point of putting in the effort and then making only 5-10 crepes. Not that there’s anything wrong with that, but if you dedicate the time to crepes, why not throw in an extra egg, extra flour and some milk and make a double batch? And so she did. She made 20+ at a time. Enough for us to have as a dessert after dinner and for breakfast the next morning. She was smart like that. Busy moms always are. I don’t make crepes often enough. They seem so ordinary that I always feel I should make something more special for dessert or breakfast. But then when I do make them, they’re always so good I end up saying that (“they’re so good”) over and over again as we eat. And I am always reminded I should make them more often. I think I make them about once every month or two, except in February this has turned into once a week and no one is complaining! I broke the “double batch” rule with these triple chocolate crepes. They’re so filling, I make them with only one egg which results in about 9-10 crepes. I make up for the smallish number by smothering them with chocolate. Hence the “triple” name. First we have the chocolate crepes. They’re very much like the classic crepes, but have cocoa powder added to the batter. This is a small addition, but definitely makes a difference in taste. 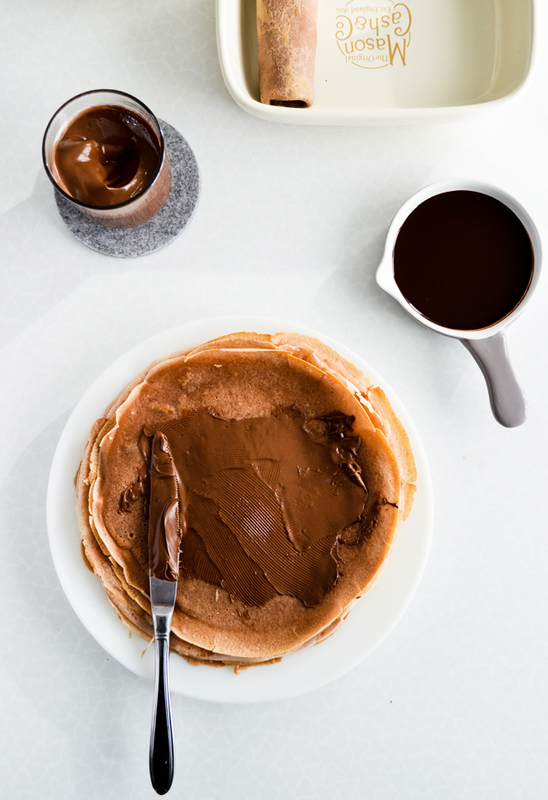 The second component is the Queen of all chocolate spreads – Nutella. I don’t even want to compare it to other chocolate spreads to be completely honest, because it belongs in its own category (fangirling hard here, I know, I know). The third component is the chocolate sauce, a mixture of milk and dark chocolate. 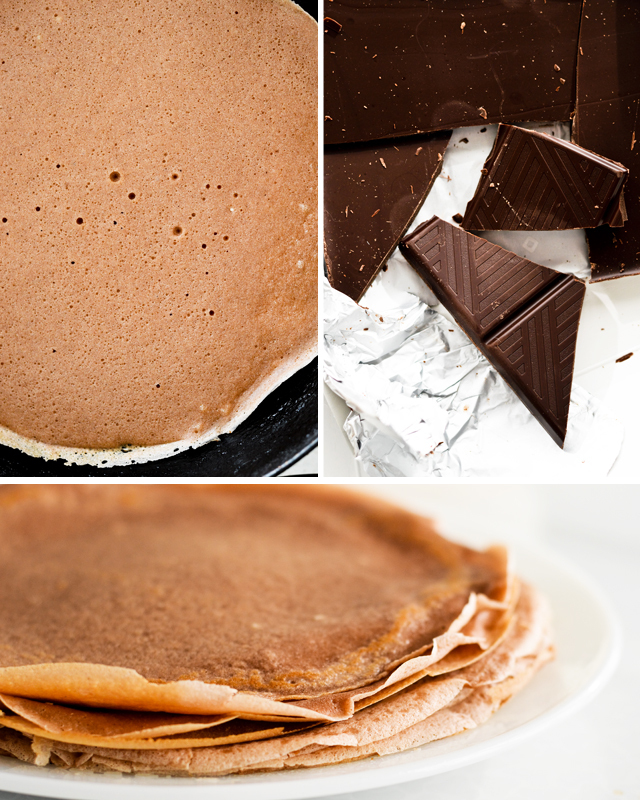 Together all of these form a perfect trio, a decadent chocolate crepe, the kind you’ll always want from now on. Up until this point, I have always thought crepes with Nutella are the best thing in the world. Well, chocolate crepes with Nutella are competing with that now. They are just that good. A triple threat dessert to satisfy every pancake and chocolate craving! Recipe makes 8-10 crepes and serves 2-4 people. In the bowl of your electric mixer or a regular mixing bowl, beat the egg with the sugar and salt until fluffy, about a minute. Add a few tablespoons of the flour and whisk it in. You want to do this so that the egg is well incorporated and you get a nice thick paste, which is the base for further additions of flour and milk. Whisk in 1/3 of the milk. Add 1/3 of the flour. Repeat until you’ve added all. Mix well after each addition. Doing this in a few steps, slowly, rather than throwing it all in, is going to make your batter smooth, like a soup and your crepes perfect. Lastly whisk in the cocoa powder and ground coffee. Set aside. (If you’re using cooking spray, you can skip this step.) Put about 1/3 cup of oil into the pan and let it warm up. Once the oil is warm, take the pan off the stove and transfer the oil to a small bowl. This way the pan is all set, and if you need oil later you have some warm all ready. I always use a soup scoop when making crepes, so add one scoop of batter to the pan and quickly swirl the pan so that the batter evenly and thinly coats the bottom of the pan. Cook for about 30-60 seconds (depends on the pan, when the edges of the crepe get crusty, the crepe is ready to be flipped), then flip the crepe with a spatula. Cook for another 15 seconds and transfer to a plate. Continue with the rest of the batter. Add 1/2 teaspoon of oil to the pan when it is too dry. I usually do it after every second crepe. If the crepes seem too oily, tap them with a paper towel. Spread about 1 tablespoon of Nutella over each crepe. Fold in the opposite sides and roll it. Place crepes in your serving dish. In a heatproof bowl placed over a saucepan of simmering water, melt the butter and chocolate. Stir with a silicone spatula and add 1-2 tablespoons of water. If you want a thick sauce add less water, if not add more. 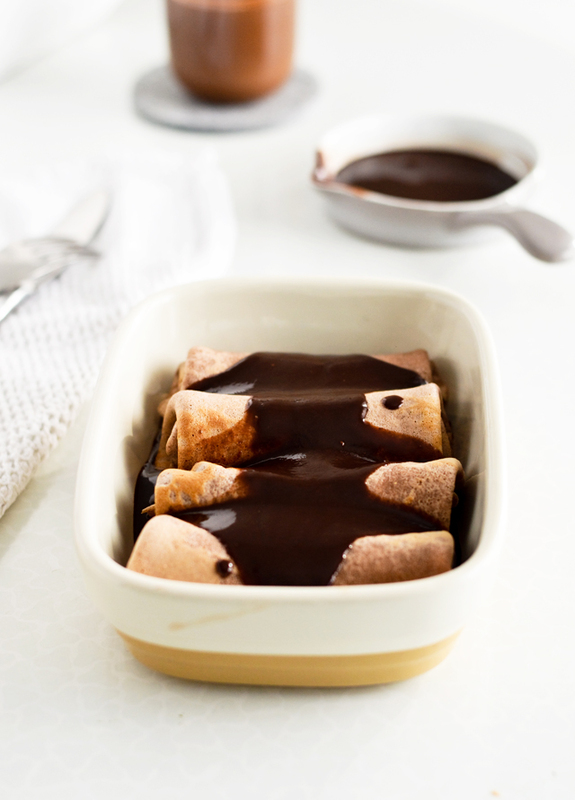 Pour the hot chocolate sauce over the crepes and serve. MAKE AHEAD: you can make both the crepes and the chocolate sauce a day ahead. 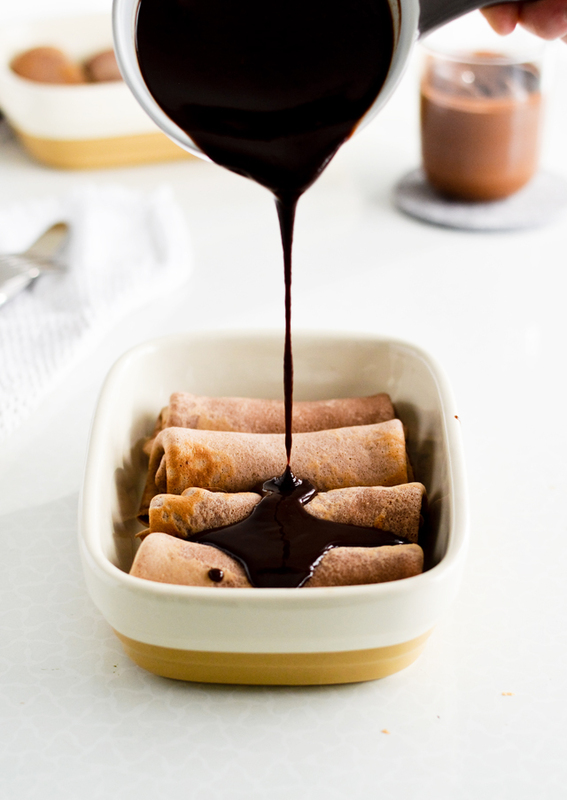 Spread Nutella over warm crepes, roll them and store in an airtight container (or a small dish covered with plastic wrap). The same goes for the chocolate sauce. 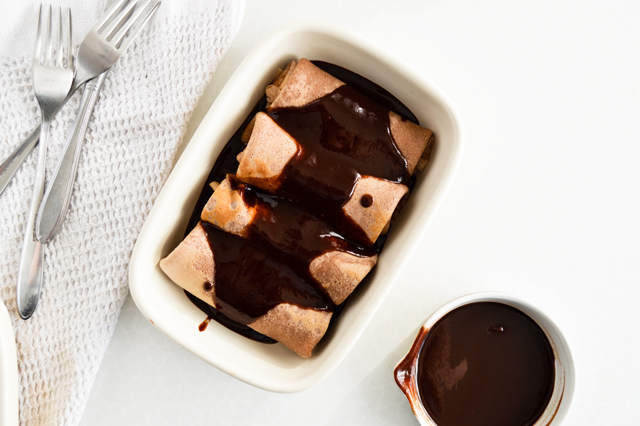 When you are ready to serve, rewarm the chocolate sauce in a microwave (you want it very warm), stir it with a spoon and pour over the crepes (if these are very cold too, 15 seconds in the microwave should bring them to room temperature). I have two pans for making my crepes, both have previously belonged to my mom. The first is actually a very old skillet with a diameter of about 21.5 cm (8.5 inches). The second is a classic non-stick (teflon) pan with a diameter of almost 23 cm (9 inches). Both of these make great crepes. You can make your batter with a regular stand mixer, a hand mixer or just with a bowl and a whisk. Lately, I’ve been doing the latter. I feel it takes the same amount of time and I have better control over the batter. I always heat some oil in the pan, to make it very greasy and to have warm oil on the side for greasing the pan as I make the crepes. My mom always used this method and it has never failed me. The end result are perfect, non greasy crepes. I never serve the “testing” first crepe. That’s the crepe that soaks up any leftover oil and makes the pan perfect for the following crepes. It is oily and usually thicker than the rest, but it makes a great mid-cooking snack. For the sauce, you can use a chocolate with around 50% cocoa solids to avoid using two different ones. I serve a set of 4 crepes in one 20 x 14 x 5-cm (7.8 x 5.5 x 2-inch) stoneware rectangular dish. The ones pictured are made by Mason & Cash. 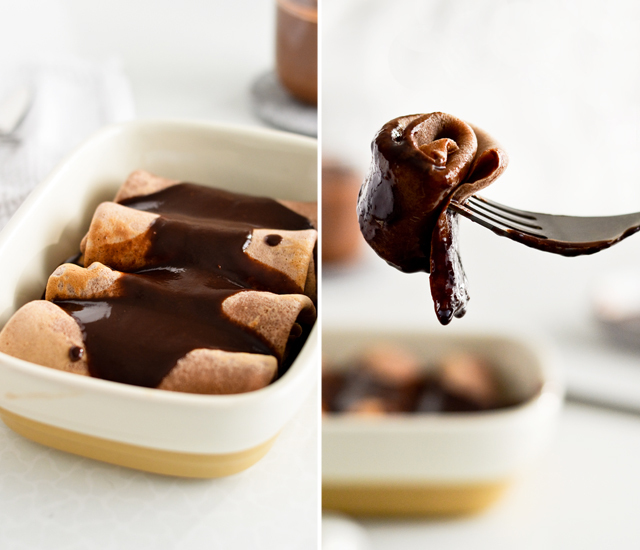 Crepe covered with warm chocolate, is there something more delicious? I used to make these and forgot about them. Now is the time to rediscover it. Thanks! Looks super delicious! Love your website and beautiful photography. Thank you so much, Dorien!